after 13 years in the pub trade you really do need to employ more staff or train the ones you have to serve a bit quicker ,for Christ's sake to hear from a bar maid your my 2nd your my 3rd your my 4th while waiting for a drink is pathetic I felt like I was in a dinner queue and I'm supposed to feel grateful. Had it not been for a mates birthday I would have walked out. AVOID THE QUIZ NIGHTS HERE LIKE THE PLAGUE. They are sponsored by google - waste of time. Barman gives answers out to folk and use of phones is ignored. Beer ok nothing special. Bettr two great beers than more mediocrely kept ones. 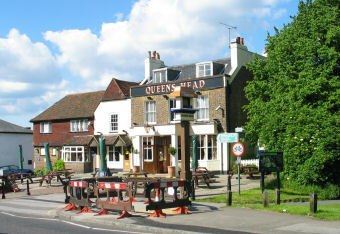 I went to the Queens Head on Sunday for what I thought would be a pleasant lunch - I was wrong! After waiting at the bar to get served (about 15mins) my food and drink order was taken. I asked what the soup of the day was and was informed this was vegetable. We were informed that there was a wait of 30-45mins on food order as they had a rush on (the pub was half empty), but we were not in a rush so thought "what the hell". After 45 mins the food ordered, mine a chicken soup (after I had been informed it was vegetable, lucky I am not veggie). It resembled a cuppa soup and was luke warm. Absolutely starving, I ate it. After an additional 45mins our main course arrived. I had fish and chips which was inedible. The chips were again luke warm and the fish was either frozen battered fish or had been re-heated, it was vile!! My friend had the roast dinner and said it was "OK" nothing special. After another 30 mins, our plates were cleared and we asked where my friends desert was. The waitress shurgged her shoulders and said she would try and find out. After another 20 mins, it arrived. It was inedible as it was cold in the middle when it was meant to be a sticky lemon sponge (served hot)! I would NEVER go back to this pub, not even if I was desperate. It is by FAR the worst place I have ever been to in my life. Shame on you Ember Inns! !